I hate heights. I once attempted to make it to the top of the Eiffel Tower, but after getting out of the first of two elevators, I clung to the girders and found myself unable to move, so convinced was I that a structure that had stood for over 100 years was going to spontaneously collapse beneath me. So why did I ever think that combining heights, a steep spiral staircase in a ruined castle, and the windy gusts of Storm Gertrude would be a good idea?! 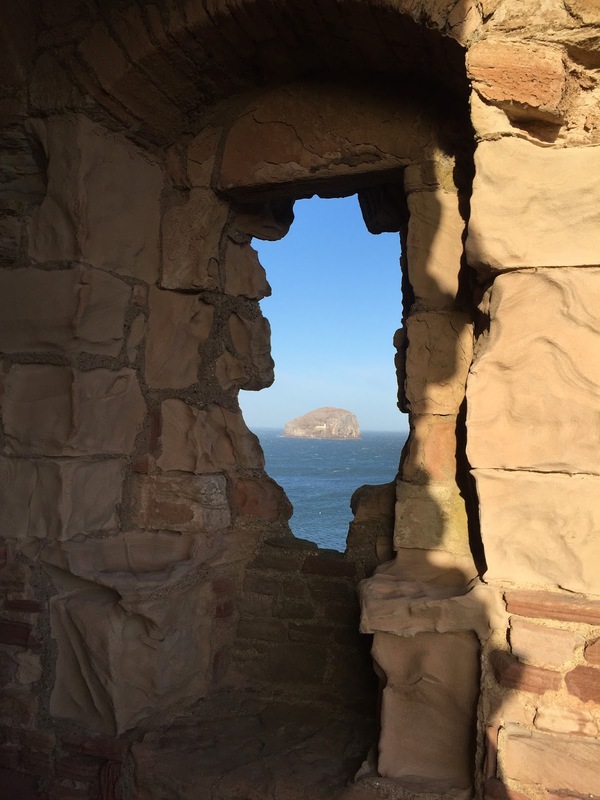 Tantallon Castle is perched on the cliffs near North Berwick in East Lothian. 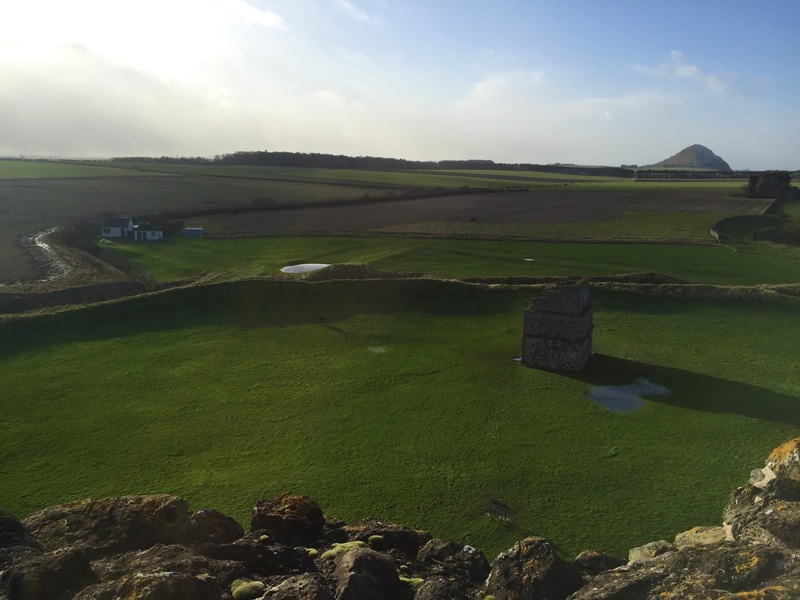 As it is, East Lothian (and particularly North Berwick) is one of my favourite places to visit - combining history, beautiful rural scenery and gorgeous beaches. 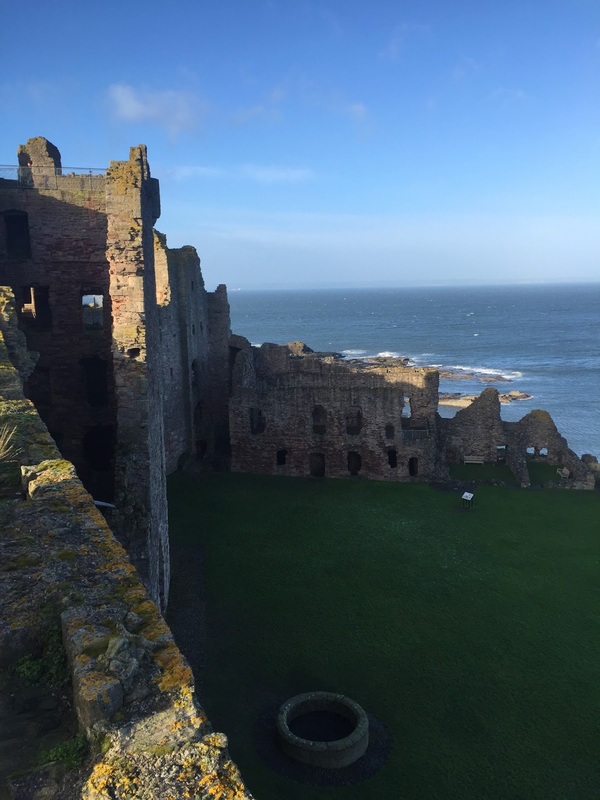 However, for one reason or another I'd never visited Tantallon Castle before, so of course I chose to do so on one of the windiest days of the year. The castle was originally built by William Douglas, later made the 1st Earl of Douglas, in the mid-1300s. History gets a bit complicated from here, as it is always going to when the Earl is having it off with his sister in law and produces an illegitimate son, but basically, following the death of the 1st Earl's legitimate son (who had no heir), the castle passed to the illegitimate son, George Douglas. 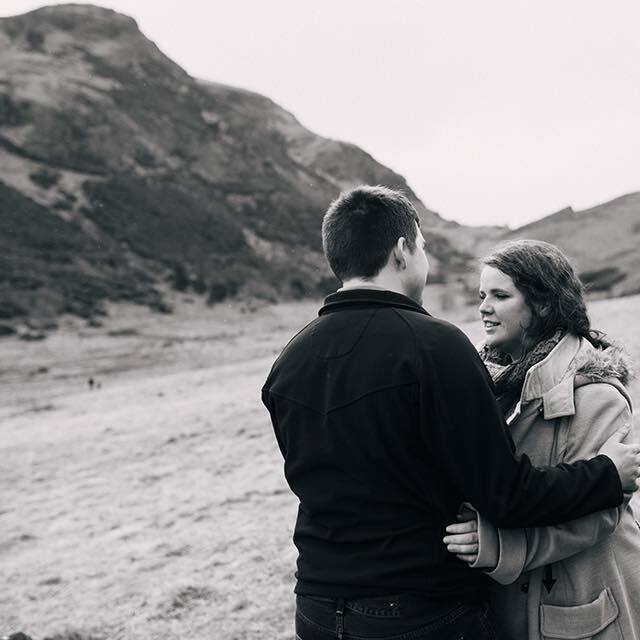 George's mother had great positions of power, being a Countess of Angus, so George ended up marrying the princess Mary (daughter of King Robert III) and being named as 1st Earl of Angus. This split the Douglas line into two branches: the main line known as the 'Black Douglases', and George's junior line, the 'Red Douglases'. 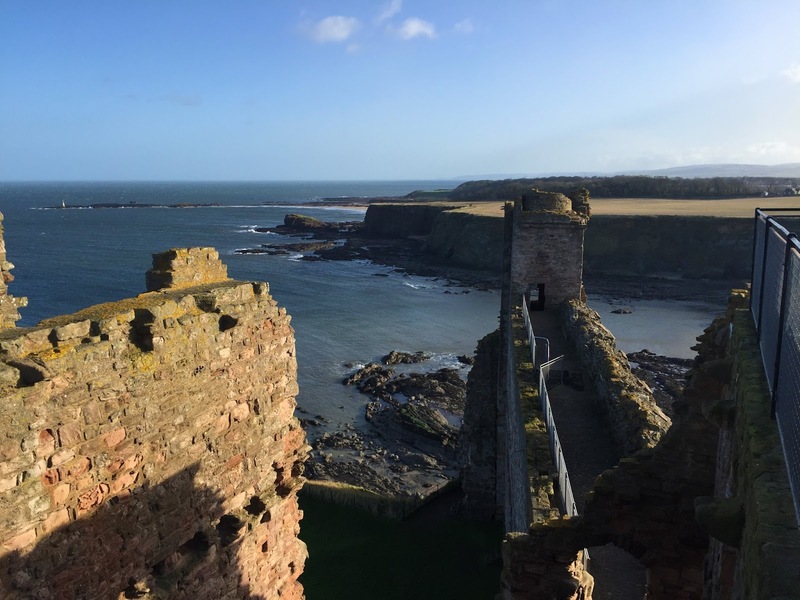 Tantallon Castle passed down the Red Douglas line and remained the possession of the Earls of Angus for around 300 years. Views from the top of the Gatehouse Tower. It wasn't all peace and harmony though, as there were three major sieges of the castle. Archibald Douglas, the 5th Earl of Angus seemed to have a bit of a thing for rebelling against kings, first marching against James III and then making a treasonable treaty with Henry VII of England against James IV. This didn’t go down well with the Scottish king, who besieged Tantallon in 1491. Archibald was forced to hand the castle over, but it was back in his possession by 1493. It seems to me that these Douglas blokes are a dodgy lot. The 5th Earl’s son, also named Archibald, married Margaret Tudor, James IV’s widow, daughter of Henry VII and sister of that little-known king Henry VIII. In fact it was this bad tempered monarch who supported the 6th Earl when he decided to effectively kidnap his stepson, Margaret’s son King James V, holding him as a virtual prisoner for around three years (later on James becomes father of another unheard-of monarch, Mary Queen of Scots, but that’s another story). James V escaped his evil stepfather’s clutches, and it all kicked off. In 1528, King James bombarded the castle for around 20 days, Archibald counterattacked and later fled to England. 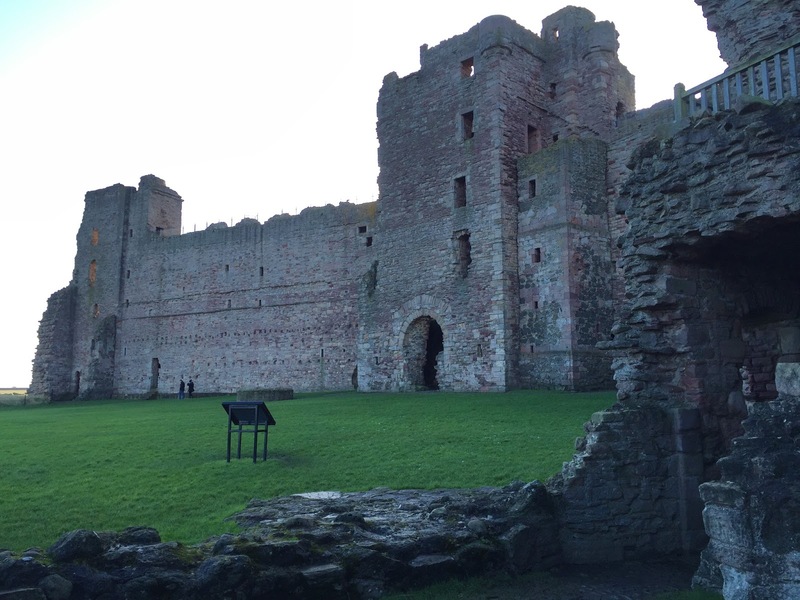 Tantallon then became a Royal fortress, which the king fortified and strengthened with fairly substantial repair works, until James died, and old Archie returned to claim it. The final siege was in 1651, when Oliver Cromwell sent General Monck to attack a group of around 95 Royalists based at the castle who were interrupting his lines of communication following the Parliamentarian invasion of Scotland. Not one to do things by half, the troops sent to help lay siege to Tantallon numbered between 2000-3000 (a bit overkill against 95 blokes you’d think). Cromwell’s troops spent 12 days battering the castle with cannonfire before breaching the Douglas Tower, when the defenders of the castle were forced to surrender. This siege left the castle in ruins, and ended the 300-odd years of habitation in the building. On approaching the castle, it is partially obscured by built up earthworks, I assume used as defensive structures, and the path twists to one side to take you through the only remaining piece of outer wall. 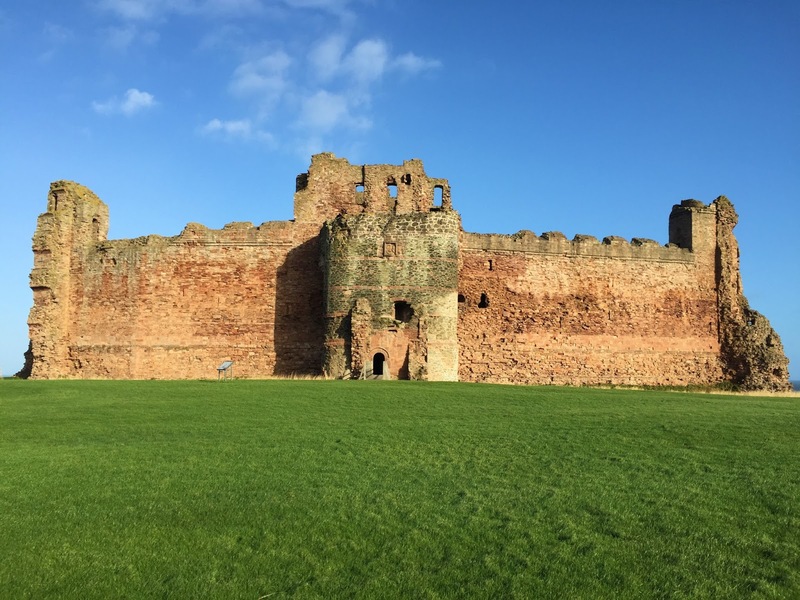 Once you step through this outer gateway, you're greeted by the stunning sight of Tantallon in all its glory. It's also at this point that you will realise that the SD card for your camera is still in your laptop back home, and you will have to rely on an iPhone with 8% battery for all the photos you intend on taking. Great. As I mentioned, we visited on a really windy day, but the rest of the weather was pretty perfect. It was sunny and clear, and really showed off the beautiful views this castle would have enjoyed. 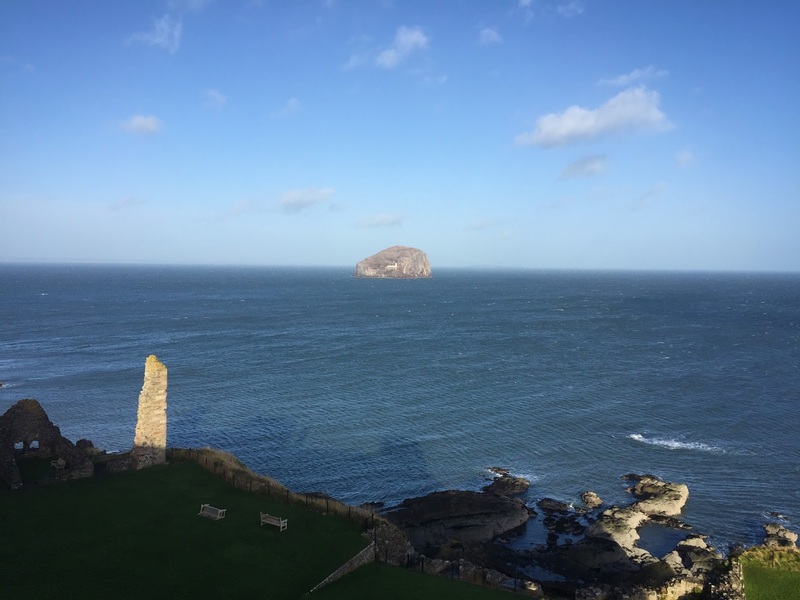 I mean, I assume it was built on a cliff mainly for the defensive aspect more than for gazing out longingly across the Forth, but y'know, getting a great view of Bass Rock is just an added perk. 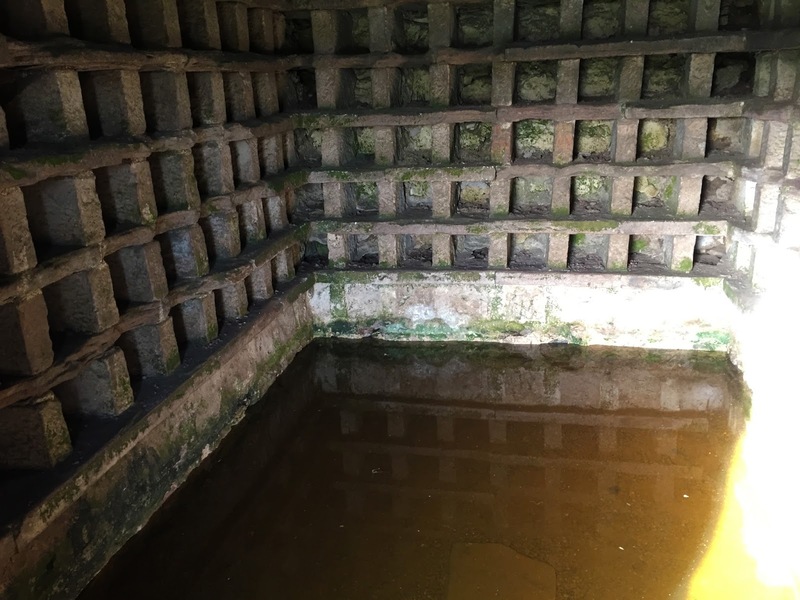 It was however really wet underfoot, as the flooded doocot will prove! 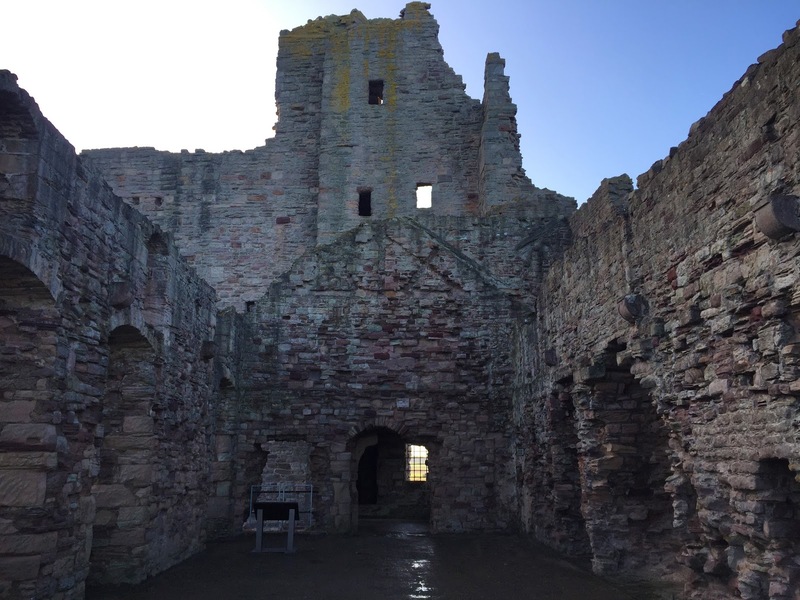 The castle consisted of a long, thick, high curtain wall, defending the landward side, and three main towers with residential quarters: the East Tower, the Douglas Tower and the Gatehouse tower. Surrounded as it was on three sides by cliffs, the structure essentially boxed off an inner court area. There's evidence of lean-to buildings that would've been built against the inner side of the curtain wall, but all that is left is the scariest well I've ever seen in my life. There's something about a 32 metre drop through a cliff that makes me feel uneasy, and reading about how the original walls have taken a tumble down the precipice didn't help matters. The interior of the Gatehouse Tower. You can clearly see where floor supports would have been, and each floor's canopied fireplace. I'd have loved to see what this looked like when it was used! The curtain wall is in fairly good nick, and the towers are too. Okay so they don't have floors, and the Douglas tower has kind-of-sort-of collapsed a bit after that final siege of 1651, but you really get a good idea of the scale of the castle. I’ve visited a lot of historic buildings in my time (that makes me sound about 60, but I just really like medieval stuff!) 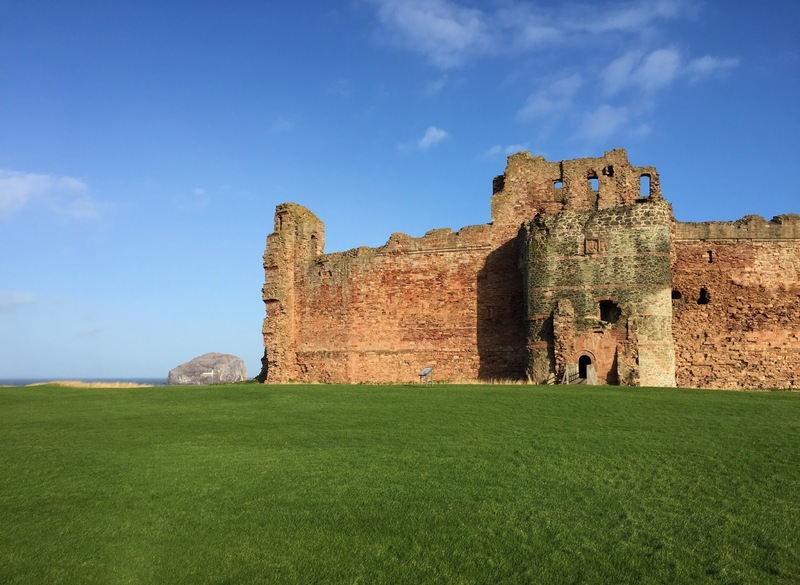 and I was a little surprised at just how big Tantallon was - the Douglas Tower consisted of seven floors, and the East Tower of five until the 1528 siege. The style is also interesting, as it is the last curtain wall-style castle built in Scotland, with most constructions of that time tending to favour smaller, tower house style buildings. The East Tower on the left, and the Gatehouse Tower. 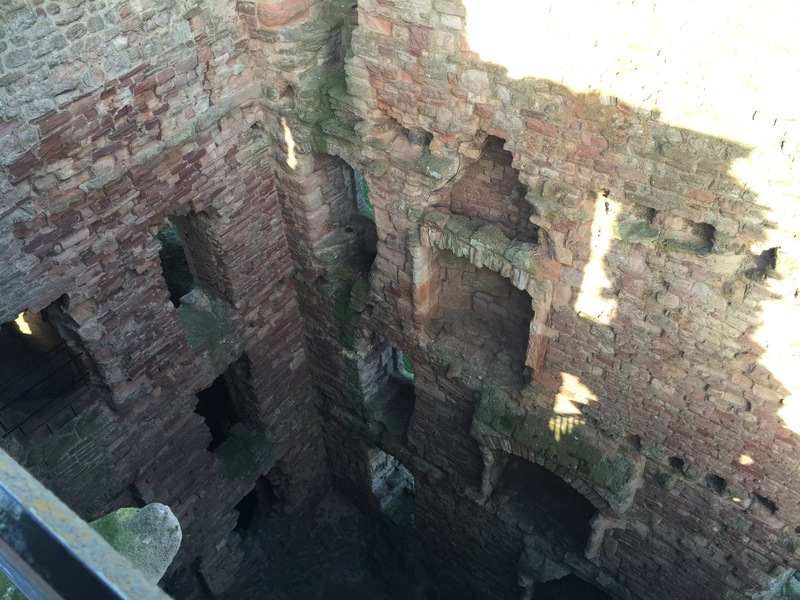 One of the best (or worst, depending on how you look at it) parts of visiting Tantallon Castle is that you can easily access the parapets along the top of the curtain wall, and even climb to the top of the Gatehouse Tower. The wall has two recesses housing spiral staircases up to these battlements, and we set off up them pretty much as soon as we entered the inner court area. However, this is where all my problems started. The battlements, featuring the wooden floor I refused to use. As seems fairly standard with spiral staircases, the steps are very worn and uneven. Most spiral staircases will have a rope handrail to help you, but for some reason this one was around the central pillar of the stairs, so on the right-hand side if you were climbing up. It was also fairly taut, so I felt I had to really lean across to hold onto it properly. Once we had stopped, I wasn’t sure I wanted to go up to the top, but it turned out to not be that far. However, upon arriving at the top of the battlements, the wind was HORRENDOUS. I instantly had a course of panic go through my body, and I was clinging to the ancient walls like an idiot. I willed myself to stop being so stupid, particularly as another couple had appeared via the other staircase and were looking at me like I was mental. I managed to wander up and down a bit, but I cannot stress this enough – the wind was insane. 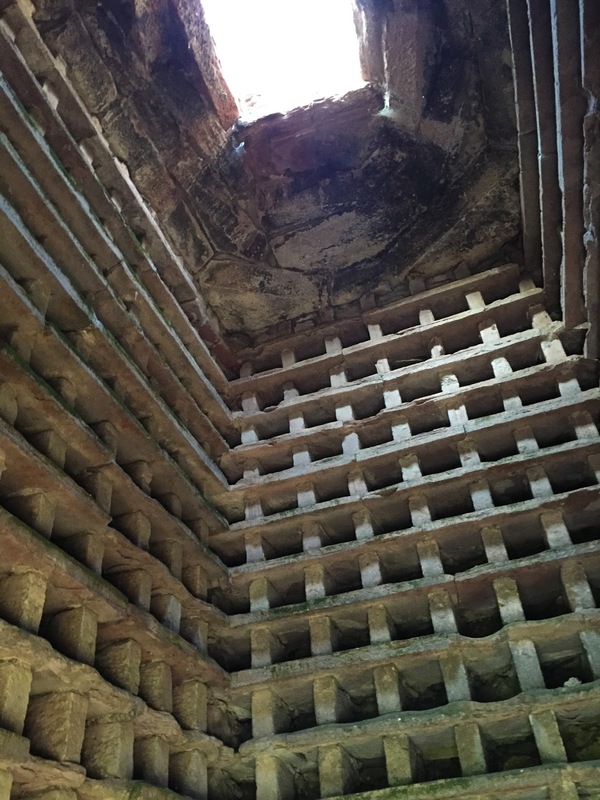 We walked towards the Gatehouse Tower as you can climb to the top of that from the parapets, but for some reason when I saw a part of the stone flooring had obviously been destroyed and had been replaced by wooden slats, I flipped. I could feel my heart absolutely racing, and even though it was literally around a metre of (clearly very safe) wood to walk over, I just couldn’t do it. I let my husband brave it alone, and made my way back to the stairs. Jesus, what a mistake. The combination of fears was intense: fear of heights, fear of strong winds, and particularly fear of falling down these idiotic stairs. I had to lean down to grab hold of the rope handrail, and it took me three attempts to get the nerve. I’m not exaggerating when I say I had one of the most intense anxiety attacks I’ve ever had (just as a side note for clarification, I personally use the terms anxiety and panic attack to mean different things. An anxiety attack for me is a reaction to a tangible thing and will end when the ‘threat’ disappears, whereas a panic attack doesn’t usually have a real cause. Anxiety attacks, while still horrible, are also usually less intense than panic attacks: I don’t tend to hyperventilate or feel sick, it’s mainly a racing heart and shaking). I honestly took about five full minutes to come down the stairs, as I had put both feet on each step. By the time I got down my legs felt like jelly, and hurt like hell for the next three days. The inner court, facing towards the kitchens and Great Hall, and the scary well! The Great Hall with the ruins of the Douglas Tower behind. 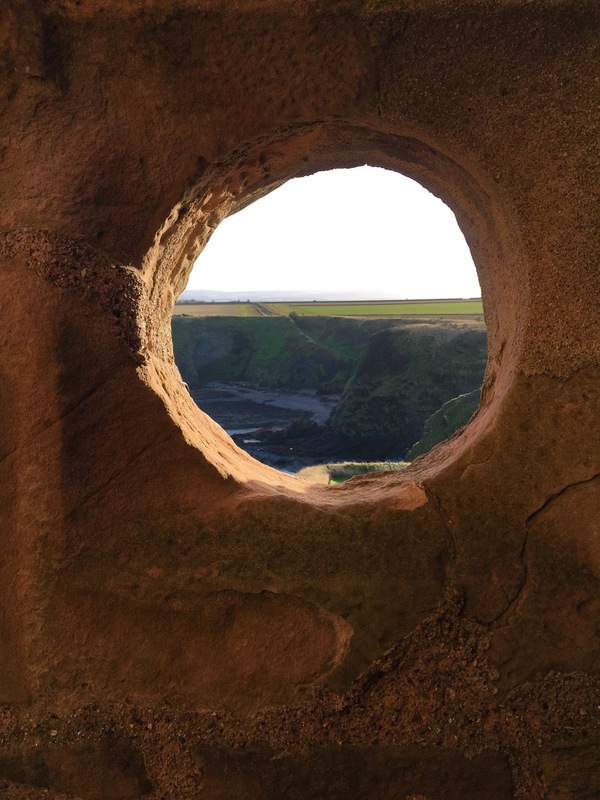 Apart from that utter terror, Tantallon was really interesting and very beautiful. I personally really enjoyed having a wander through the kitchen areas, taking a look at the bleak prison pit, and getting an idea of what the Great Hall would’ve been like. One thing I’d definitely say is that it has a really good amount of information noticeboards – I relied on them quite a lot to get a real feel for how the castle would’ve looked and operated at its peak. Obviously it’s a real shame that the towers have lost pretty much all of their floors, as access to the residential areas of the castle would’ve been a fascinating insight into how the Earls of Angus lived, but you can’t win them all. In preparing for this post I just read some reports about a purported ghost being caught on camera in the Douglas Tower. I mean, I’d love it if it was real, but it looks an awful lot like sunlight on the stone walls to me. 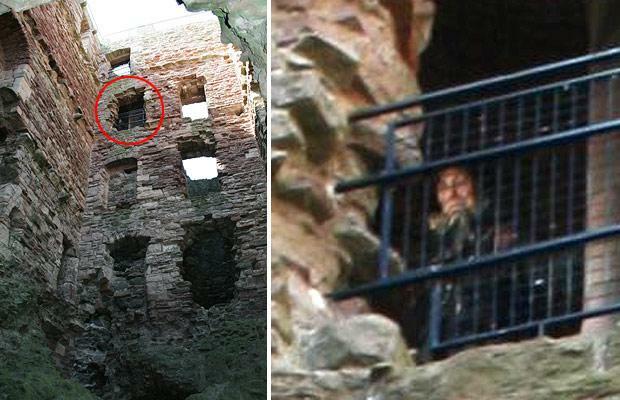 Historic Scotland, who currently look after the property, have no reports of any ‘ghostly activity’ at the castle, and it has to be said that there is no weird feeling there, unlike other places I’ve visited, but maybe you think differently? Despite the anxiety attack, I really enjoyed my day at Tantallon. If you’re out near North Berwick this is definitely a worthwhile place to make a visit. 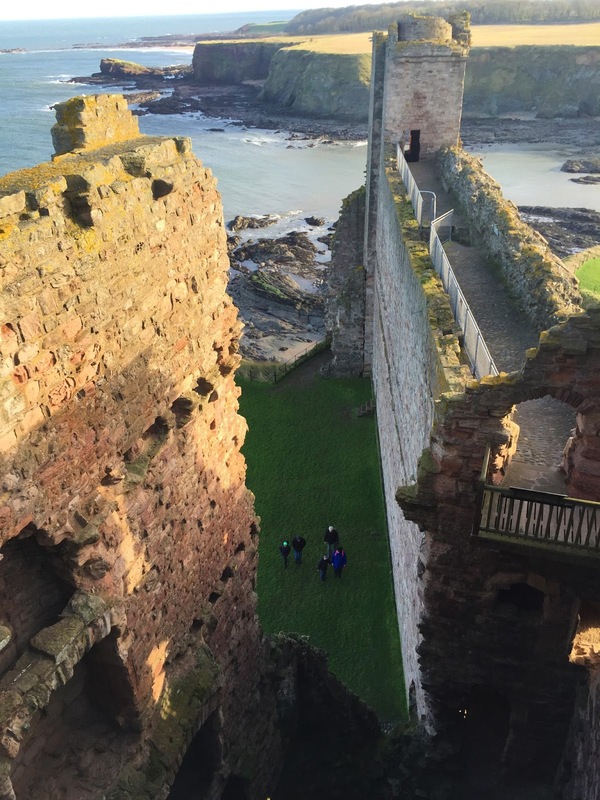 Have you ever been to Tantallon Castle? What were your thoughts?